PRESIDENT Eric Shewfelt reflects on a family business that has spanned seven decades. In 1944, anticipating a housing boom when World War II would end, Roy Shewfelt opened the doors to the Wilshire Escrow Company. Today, Roy’s descendants preside over the business, which is now the oldest operating independent escrow company in Los Angeles. In an interview last month at the company’s headquarters, located at 4270 Wilshire Blvd., current president Eric Shewfelt credited the business’ enduring success to its ability to keep abreast of technological changes, stay current on the knowledge and practices of the industry, and to remaining a truly independent and unbiased escrow agent. Over the past 75 years, the Wilshire Escrow Company has completed 136,000 escrow transactions — no small feat. Since opening, the family-owned business has grown to include not only residential escrows, but also business escrows, liquor licenses and even stock transfers. NEXT GENERATION of the Wilshire Escrow family stands ready for the challenges ahead, including, from left, Matthew Shewfelt, Brian Shewfelt, Joanna Shewfelt Girard and Joe Multari. “I can remember, as a little kid, my dad driving us out to Simi Valley with a typewriter and paper and doing escrows in the parking lot when guys were buying homes under the GI Bill in the 1960s,” says Windsor Square resident Eric Shewfelt, the fourth Shewfelt to serve as the company’s president. And with Eric’s two sons, Matthew and Brian, niece Joanna Shewfelt Girard, and nephew Joe Multari now at the firm, the fourth generation of Shewfelts is primed to next take the reins. “We kind of run the business by committee,” explains Eric. To give me an idea of what Wilshire Escrow will look like in the decades to come, Eric asked the next generation of Shewfelts to join us. I asked them to discuss their vision for the future of the company. “I think it’s about maintaining the things that have already made this company as strong as it is today. For me, that is a focus on client relationships, trustworthiness and providing a good service,” says Matthew, who has been working at the company since 2010 after graduation from UC Santa Cruz. According to Joanna Girard, who serves as director of operations, the best approach is to maintain the strengths of the family business, while leveraging technology in order to be a modern, tech-savvy operation. “We want to keep refining systems to make them better. And in return, it keeps our company young,” she explains. MAP BOOK used decades past at Wilshire Escrow, to confirm land and property records, shows trolley tracks on Larchmont. 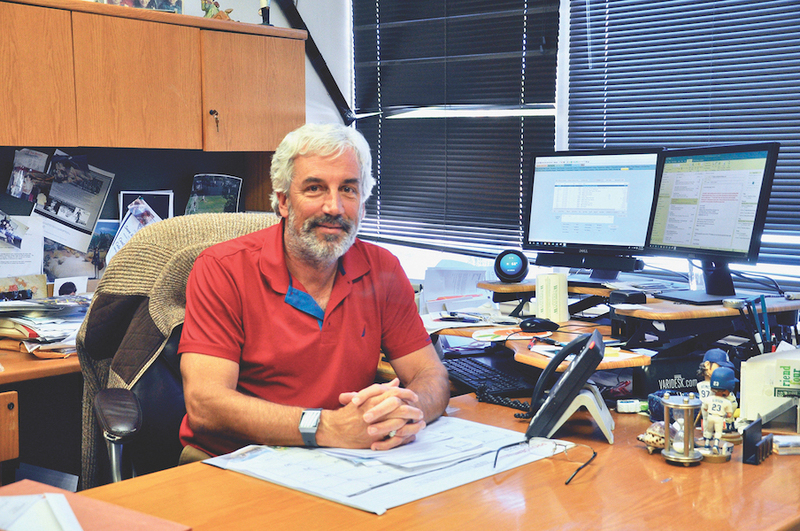 Speaking of refining systems, Eric says that technology has probably changed the industry the most since he first began: “My inbox is like an ocean, the emails just keep coming,” he says with a laugh. Of course better communication means closing a deal faster, right? “If someone calls me and says drop everything and meet this client and he’s going to wire money tomorrow, we can do it, it’s doable — but that’s all that we’re going to do for the next 24 hours. On the topic of how things used to be, Matthew shared with me some items from the company’s archives. 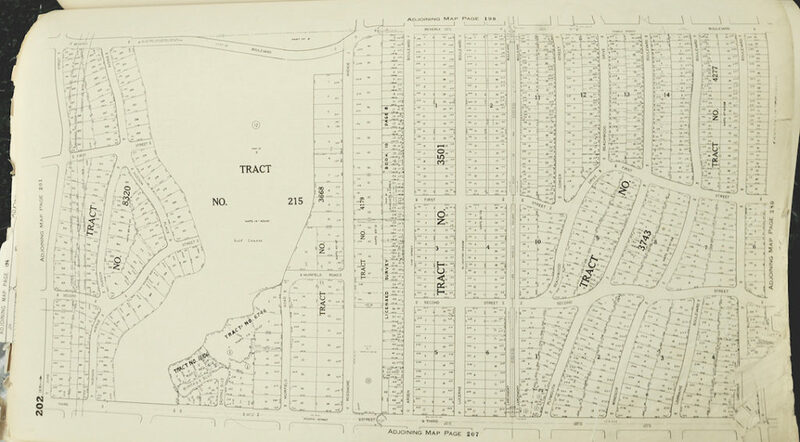 Most notable were very old bound copies of original tract maps of the neighborhood that show, for instance, a trolley line running up Larchmont Boulevard. LINING THE WALLS of the Wilshire Escrow office are old photos, such as the one above, of various Shewfelts representing the company with local officials and dignitaries. 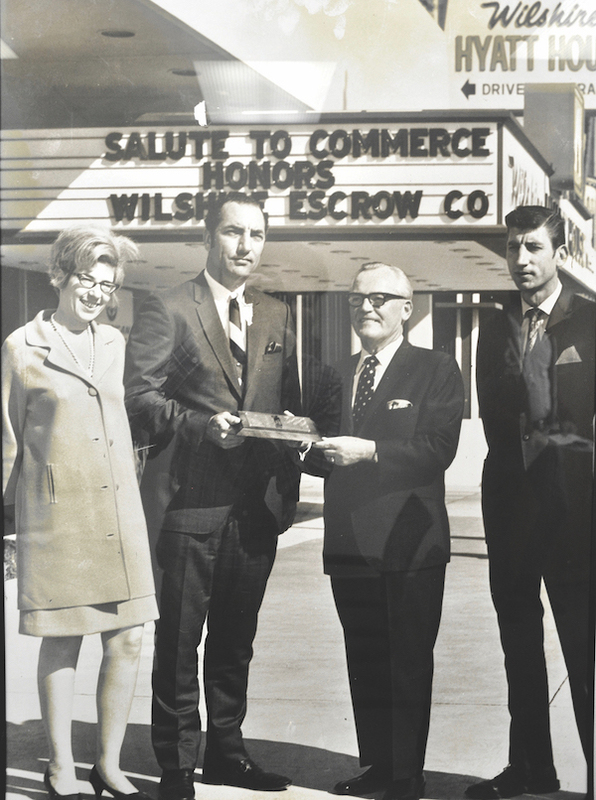 Lining the walls of the Wilshire Escrow office are old photos of various Shewfelts representing the company, standing with local officials and dignitaries. Framed is a document of one of the company’s first transactions, which lists the original escrow fee as $5. Sure, the escrow industry has changed over the years, but the service you get from this 75-year-old family business has not.